Hanukkah is upon us and so the mad dash for the perfect gift ensues. Well, let me help! A chosen few (three) will each win a copy of “I Love Jewish Faces” by Debra Darvick just in time for Hanukkah. So what do you have to do? 3. 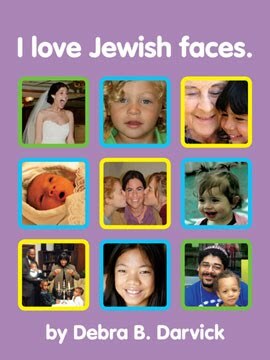 Bonus: send a photograph of the Jewish face you love! 4. Deadline is Friday, December 11, 2009. 5. Winners to be announced Monday, December 14, 2009. The Jewish face I love…has a hard time growing facial hair so it wears a goatee that’s slightly better groomed than the one Brad Pitt is currently wearing! Hardly rabbinical. But then my favorite part of this Jewish face is his nose. Yeah, yeah, yeah, you’re waiting for stereotypes but hear me out. As a kid, I was fascinated by my mother’s long straight nose and the tiny little bump on it. My thin–so thin my glasses would forever slide up and down it–little nose looked so bland and simple next to hers. When my mother was nice, her nose was the kind you wrote sonnets about. When she was cruel, it was hooked, part of a Halloween mask. By the time I was an adult, I fetishized noses. To me, Adrian Brody had the perfect nose, a nose that had character, that is until I discovered his nose. Just a regular old nose, not too big, not too small but truly perfect and utterly kissable. I liked his nose even better than his eyes which I thought were green at first, dirty pool water green until I discovered they were really blue, my all-time favorite color in the most perfect shade in the eyes of the Jewish face I love the most! I looooove Jewish faces. The Jewish face I love… has beautiful brown skin, the softest chubby cheeks in the world, deep black eyes with an impish edge to them, and a full smile that looks just like his Mayan birthmother's. I love Jewish faces! Thanks! Don't forget to follow the rest of the instructions to make sure your entry is complete! 😦 Saw the only US address, and here I am in Israel. Maybe I could snd it to my daughter? Sorry, Salixj, I can't afford to ship outside of the US but I could totally send it to your daughter if she's living here! The Jewish face I love has the most beautiful hazel eyes with dimples so deep. This Jewish face has a smile that radiates light into a room and shines deep into my heart. This Jewish face has pink lips on a mouth that speaks volumes about love and family and the virtues he holds dear. But, most of all, the Jewish face I love is like a tiny map of all the loved ones from his past that created him into the Jewish man I love. I love Jewish faces. recently though I looked at a photo of myself, and aside from the curly hair (grandma had curls, I don't) I see I look an awful lot like my Maternal Grandma. The Jewish face I love is telling me about amazing things that she is finding on the internet. The owner of the face is excited to go home to see her grandparents later this month. She is bubbling about her classes today, what she wants for dinner and how she'd like to know if she can practice driving if she can use the car. The Jewish face spoke the words she wroe at her Bat Mitzvah ceremony almost three years ago – words about maintaining the synagogue – her haftarah, her dream. This Jewish face of my daughter is now singing, talking and smiling. She hasn't stopped talking since she started when she was a tiny Jewish face. When I look at the many little faces in the classes at the Jewish Preschool where I work, I sometimes imagine what they'll be like when they are older faces. They are light, they are dark, they are sweet and they are sassy. They are Jewish and they are “Not” and not one of them cares for Pharoah. I love Jewish Faces! I love the Jewish face of my sweet and happy grandson, Zachary! His bright orange mop of hair matches his sunny personality. His eyes are backlit with innocence and joy! I love Jewish faces!